Yes that is singular. Cauliflowers elude me. I like them. Trust me I do. But they don’t grow easily for me. I probably can’t give them the time and attention they need. So from the countless cauliflowers I try to grow I am lucky to get one that doesn’t get munched to oblivion by slugs, snails, and pigeons or doesn’t dry up with lack of water, doesn’t frazzle in the sun, nor bolt as soon as it starts to form a head. So it’s party time at the seaside. We have one Cauliflower. A precious small singular Cauli. A Purple Italian variety. Way to go Italy, you may have lost the footie but you won in the Cauliflower Stakes. Picked in the morning, eaten in the evening. It had to be quick and simple, tasty and a recipe that allowed the flavour of the cauliflower to shine through – one that wasn’t drowned in a sauce. Not that I object to drowning cauliflowers in cheesy sauces, it’s just that this one was, how shall I put it – delicate and special. So a quick flick through a few recipe books and Hugh Fearnley-Whittingstall “River Cottage Veg Everyday” book came to the rescue. Don’t be put off by the cover photo, there are some great recipes in this book! I’ve reproduced the recipe as per the original, I changed the quantities as my cauliflower was so teeny. As my cauliflower was so fresh it was cooked in less than 5 minutes and didn’t need as much water. Perfect as a side dish or as a main with rice or noodles. We opted for oodles of noodles. There’s no photographic evidence of the final dish – it was too late, too dark and we were too hungry. So it may be a lone cauliflower but isn’t it pretty in purple ?! Add the cauliflower and up to 100ml of water. Cook, stirring for 5-10 minutes until the florets are starting to brown. Having written this recipe up I now realise I should have made a salad with the precious one. Something like an Asian style salad with soy and lime juice. Oh well, there’s always next year – presuming I’m foolish enough to try growing cauliflowers again, or maybe I should just stick to growing radishes….. So we make two !! i’m not sure if I will try again – this is th e3rd/4th year of trying and each year I get one for my efforts – better than none I know but still a lot of work for so little. If you do try again let m eknow your tips!! When you cooked it, did it remain purple? I’m wondering if it’s like the purple sprouting broccoli. Yes it did stay purple when cooked, it was very gentle in flavour, cauliflower for sure but very mild. 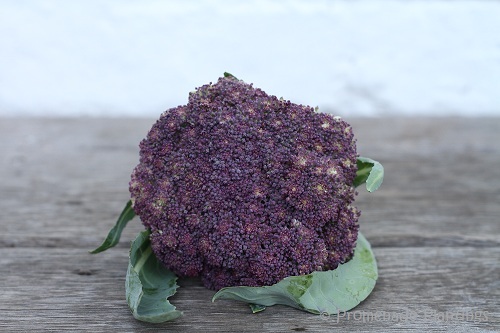 And no I’d say purple sprouting broccoli is much stronger and more distinct. There are orange ones too – called Cheddar ……. Wow, orange colour. That would look wonderful on a plate! p.s. – a hint of sun! A beautiful specimen and a tasty sounding recipe. Neither did I till recently, there are also orange ones too. Apparnetly they are quite an old variety. Brussels Sprouts are the ones that don’t do for me. I’m hit and miss with those. I had some great tips this year from a fellow blogger – to really make sure the ground is very firm before you plant, she emphasised the firm – so much so that you pretty much trample the ground, and jump up and down on it before you plant! What is it about us gardeners? We insist on trying to raise a particular plant or vegetable when the gardening gods are clearly telling us it’s a bad idea. No matter how successful the rest of the garden is, it’s the incalcitrant eggplant, pepper, broccoli, or, in your case, cauliflower that vexes us. Nevertheless, yours was one gorgeous specimen! So true John. I’ve given up on aubergines this year I’ve decided my greenhouse space is too precious for 3 aubergines. But other things, well the spirit of optimism keeps me going, but I do think I’m going to give cauliflowers a miss for a while….. famous last words ?! Quality over quantity any day I say! Are you sure that’s a cauliflower? It looks like broccoli to me from the shot above. 🙂 Not that I’m too familiar with cauliflower as by the time I saw them on my mother’s table they had been boiled, sliced egg battered and fried to a fare-the-well. A beautiful specimen though, whatever it may be. Yes I’m sure – I know where it was planted and it certainly tasted of cauliflower, although very mild. But I see what you mean it does look a bit like broccoli. I remember my granny cooking veggies like that, thank goodness she made up for it by making delicious fruit pies, the pastry was so delicate! LOL … of course you are. I think the head/florette is looser than I’m used to seeing in the colourless white balls I find in my grocery store which is what confused me in the shot. It’s SO beautiful and it came out of your garden. The torrential downpours killed off my last rosemary seedling and almost drowned my only lavender. But the sweet and genovese basil are doing ok. I harvested some leaves for a pizza I made today. I’m hoping to have some thai basil next month from seeds I preserved last fall. Only 3 seedlings are left of 7 planted but I might have mistaken one or two for weeds blowing in … there were lots of grass seeds sprouting as well which I plucked out. So hip hip horay for the basil, it survived the downpurs!! I don’t grow cauliflower, but I love to eat it. We’ll look for cauliflower at the farmer’s market and when it appears, we’ll try this recipe! One is certainly better than none. And it is a beauty. (and the Italians sure did lose the match..;-). What a score line, I felt sorry for the Italians, but the Spanish – WOW ! And you are right I am one up ! You ended up in my spam again – I can feel a song coming on !! 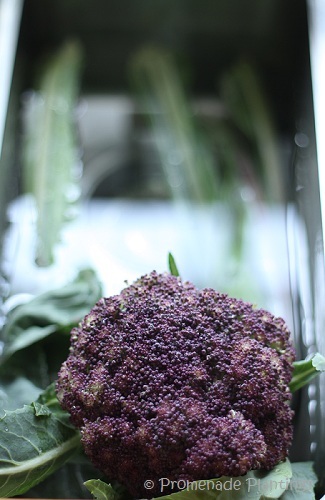 I love anything purple, so now I’m going to have to hunt this purple cauliflower down! Happy hunting, and I hope you are successful and soon! So pretty! Cauliflower is a winter veggie for me, which thankfully saves it from pest problems. Don’t give up if you love them. It has taken me ten attempts sometimes to get something to work, but usually after I get it the first time, it works out again and again. The cauli’s a re both summer and winter, I think the problem i sthat I just don’t have the time to look after them, so if I give it a break for a couple of years and then start again I might, just might succeed! There is always stuff that doesn’t work Debra, and sometimes I’m not entirely sure why, but what makes me giggle is that this is a single cauliflower out of about 12 to 20 that I originally planted – not great odds ! If you have trouble with cauliflower I won’t even try given I’m still struggling with radishes! Ha, Linda. But by some odd quirk of nature maybe you will have success with cauliflowers! A firend of mine grows perfect red cabbages, year after year, mine are pathetic and usually get composted! So you never know…. I love cauliflower… and have a number of ways to prepare them… sometimes I slice them into thin slices and eat them raw in a salad. It’s true, though, that they have a number of enemies. It is hard to get them completely whole. I like the sound of your raw cauliflower salads Shimon, I think I’m going to go back to the shop and buy mysel a cauliflower – so much easier ! claire, that is a magnificent cauli!!!! Purple cauliflower with oodles of noodles sounds like a nice meal to me. We can give our plants lots of care but sometimes we just can’t get them to produce. Gardening isn’t easy. So glad you finally have some warm weather. I’m glad you made this, Claire, because now I have another nice recipe for cauliflower. I had my first sweet corn and tomatoes of the year yesterday from a farmers’ market in another part of the county. “My” farm says a cold snap has delayed eggplant and tomatoes for another some weeks, but we are getting our first fresh green beans: summer is beginning in the food world in California. Lovely to see you back home Sharyn! I think the combination of cauli, sesame seeds and soy is a winner so I hope you like it. And your food markets always make me drool, our local veggies are starting to make an appearance, I had cherries yesterday – perfect! Well I’m impressed! I’ve always heard that cauliflower is one of the hardest things to grow. I haven’t even attempted it. Maybe next year. . .
Kate it really is a hard veggie to grow, I’ve tried for a few years and plant anything up to 20 caulis, and year after year I’m lucky to get one! I think it’s time to grow something else 🙂 But you might have better luck than me! That’s just beautiful…I have issues with cole crops of all kinds. Whitefly, mostly. And slugs. Whitefly is a pain isn’t it! The garden didn’t seem to suffer as much last year, I’ve no idea why though! On a positive note – at least you are not in the spam like Celi’s comments!! I only had that problem with her’s once last week, but they get Held for Approval sometimes. Your did too, when you changed your avatar and signature. Such a pretty little cauliflower, just love that color! I love cauliflower with curry, but yours was so delicate, I think your treatment was perfect. I’ve never had purple cauliflower and may keep my eye out for one now to try. Love the sound of your recipe! I adore a cauliflower curry, and I did have that in mind, but decided it was too delicate for any strong flavours. Look out for orange cauliflowers too !! Your purple cauliflower is beautiful. We get the orange ones sometimes from the CSAs and I like those too. Tried to grow them last year, alas, not successfully:(. I’ve never tried the orange ones, I’ve only seen the seed packets 🙂 I think cauliflowers are tricky, so we are not alone on this one Inger! That is a very beautiful cauliflower and my dad will be pleased to hear that Italy delivered well finally on something! Lovely recipe too. I´ve been tempted to buy the book…are you impressed with it? Yes I am, really pleased I did pick it up – this is all veggie so suits us down to the ground, lots of ideas, and variations on dishes so it makes it flexible to use and cook from. Plus lots of the veggie dishes aren’t and aside or a dish to go with meat, they are a meal in themselves.